Cornerstone Legion Baseball had its most successful week of the 2011 season, improving its overall record to 8-7 by winning four of five contests in a hectic four-day stretch. The Albion Cornerstone Juniors opened their run by sweeping a doubleheader from Neligh’s Juniors and Seniors Wednesday, June 15, blasted Wood River Thursday and scored a come-from-behind thriller over longtime Legion nemesis Aurora Friday before dropping a decision to St. Paul Sunday at the Albion Sports Complex. Cornerstone was scheduled to play host to Wayne Tuesday for a doubleheader, then compete in the Central City Tournament June 24-26. Cornerstone Legion Baseball began its four-day grind at Neligh and had little trouble sweeping a doubleheader from the host squads. 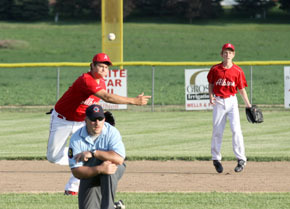 The Albion Juniors routed Neligh’s Juniors 20-2, then defeated the Neligh Seniors 15-5 in the nightcap. 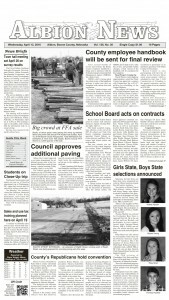 It turned out the Cornerstone Juniors were just getting warmed up at Neligh. Returning home Thursday, the locals blasted Wood River 22-2 in five innings. It took a fast start and a furious finish for Cornerstone to notch its fourth consecutive win – a 9-8 thriller over Aurora Friday in Albion. Cornerstone’s bats went quiet and the win streak came to an end Sunday in a 5-1 loss to St. Paul at the Albion Sports Complex.